Shirts With Random Triangles: Georgia QB Hutson Mason taking social media sabbatical for 2014 season. Georgia QB Hutson Mason taking social media sabbatical for 2014 season. If you're wanting to give Georgia starting quarterback Hutson Mason a piece of your mind on Twitter or Facebook during the 2014 season, don't expect him to be listening to you. Mason says he's staying off social media during the season. "It just helps me stay focused," he (Mason) said. "When you get (negative) stuff like that, it can be a little discouraging. You don't realize how blunt people can be." 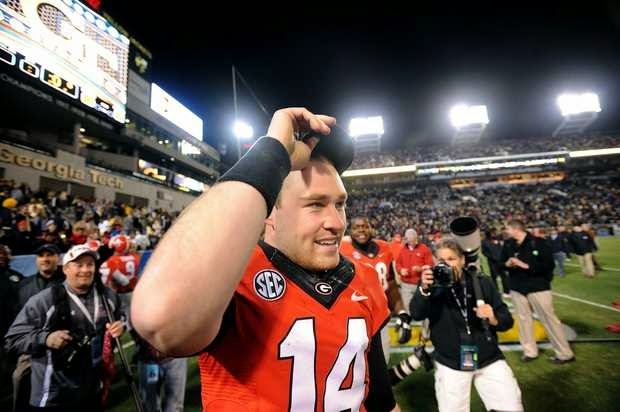 Mason's career as the Bulldogs' regular center came under unforeseen circumstances following the loss of former UGA QB Aaron Murray during the Dawgs' win over Kentucky. Mason went on to win his first start the next week against Georgia Tech in overtime. He and the Dawgs lost to Nebraska in the 2014 Gator Bowl.